A bridge in Newcastle which was damaged when a water main burst has reopened. Newburn Bridge closed to vehicles after a pipe burst on 21 May. Twenty nearby homes had to be evacuated. Last month Northumbrian Water halted construction work to allow electrical cables to be moved. 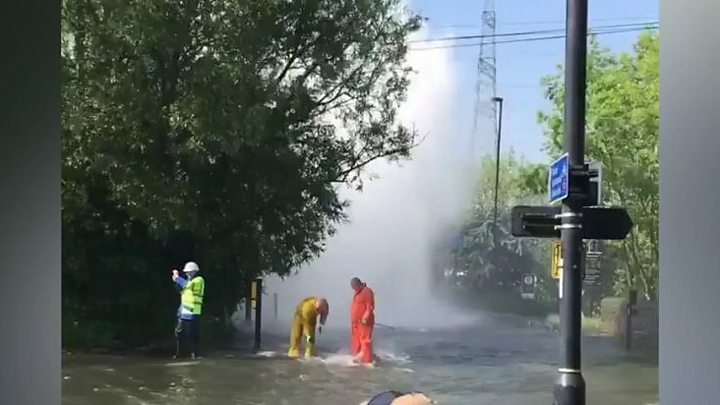 It was initially estimated the repairs would take two months following the "catastrophic burst", which saw cars parked on nearby streets submerged before engineers stemmed the flow. Northumbrian Water said the reopening on Sunday comes a "week earlier than originally planned". Pedestrians have been able to use the 120-year-old bridge, which links Newburn and Blaydon, since shortly after the burst.